Share the post "Mixed Company"
While out showing an acreage today, I had one of the most delightful encounters with some roadside poultry. 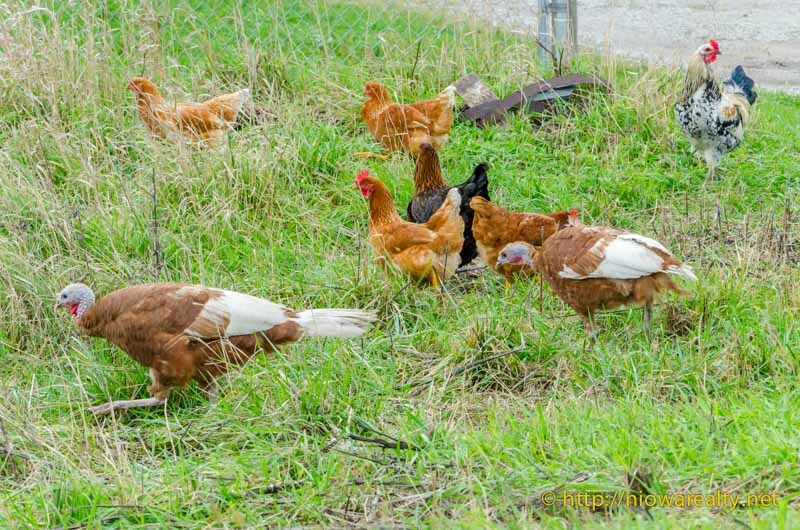 When driving to the acreage I noticed a homesite that had a few chickens running around outside. After I showed my buyer the acreage, I drove back the same way I came and noticed that there were more chickens and to my surprise, two turkeys in the group. I thought the sight of them were too special to not capture on camera. I stopped on the roadside and walked back with camera in hand. They must have thought that I was going to feed them something or possibly try eat me, because instead of running away, they started coming closer. Oh what a sight! To see turkeys in among chickens was quite unusual. At first glance, I thought the turkeys were wild, but looking closer I could see they were a domesticated breed. Most people think that chickens eat only grains, but in fact they are definitely meat eaters. They will likely eat anything that isn’t bigger or faster than they are. When on the farm, we had a separate pail with a lid where was placed old leftovers, potato peelings along with anything that was edible. Every day the pail was emptied in the chicken pen where the chickens would go wild getting their share of the treats. People who have chickens will sometimes let them spend a little time in their fenced-in gardens to help keep the visible bug population down, but if left there too long, they will also start eating the veggies. When there’s a rooster in the crowd, it makes for a more aggressive flock with the dominant male being the lead trouble maker. As a small child, I remember being chased by a rooster more than once. The really naughty ones would find themselves the main course of a Sunday dinner. I’m a bit surprised that more young families who live in neighborhoods here in Mason City that don’t have restrictive sub-division covenants, aren’t creating small chicken houses for their children to learn how to raise poultry. I’ve seen some really very up-scale sub-urban chicken houses that wouldn’t be visually obtrusive in even the best of neighborhoods. I’m not so sure about raising turkeys in the city since they do grow to be quite large and if their wings aren’t clipped just as chickens, they would likely start flying. I’m sure there would be quite a crowd drawn if one would find a turkey perched atop one of the buildings downtown. The more I think about it, the more I believe parents should start having their children raise a few chickens. The lessons would be life-long and the memories precious. I’m really glad I had an opportunity to take the above photo of some mixed company today.